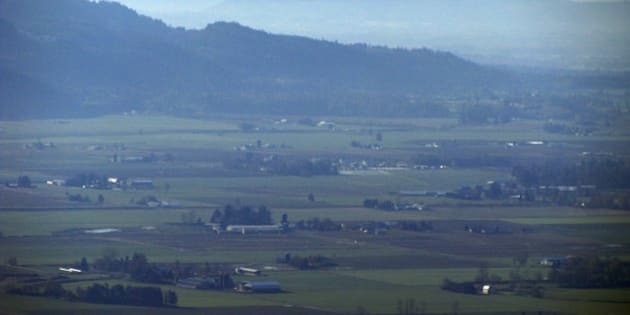 Deep zoom from Sumas Mountain near Abbotsford looking south into Washington. A B.C. developer is calling on the province to fix gaps in heritage conservation laws, after the City of Abbotsford recently rejected his bid to build a farm equipment dealership on a property believed to be the site of aboriginal mass graves. At the heart of the dispute is a 160-acre property on the slopes of Sumas Mountain, currently a mixture of farm pasture and woodlands. Corpus bought the property in 2011 at a foreclosure auction, with a plan to build a $40-million residential and industrial project, which would include a retail mall for farm equipment. But members of the Sumas First Nation were dismayed when they learned of the proposal. Silver is “relieved” the development was halted, but said confrontations between private property owners and First Nations will continue to cause economic uncertainty in B.C. until the provincial government reforms the current system. “Non-native people have all kinds of protections around their cemeteries, yet the province won’t recognize ours,” he said. The burials date back to 1782, when the Sumas people were decimated by a smallpox epidemic that reduced their population by 80 per cent. According to oral history, the survivors buried the dead at a spiritual site now known as Lightning Rock. “At one time, it was a living being – some say a shaman – who put a challenge to the Thunderbird. That&apos;s where the lightning came from. It split it into four and that&apos;s where he sits now,” Silver said. In addition to that “transformer” rock, archeologists found culturally modified trees and more than 40 earthen mounds on the property, believed to be burial mounds. “This is a hot spot in the cultural landscape,” said Dave Schaepe of the Stó:lō Resource Management Centre, which conducted the archeological assessment in 2006. Glazema said he and his partners had no knowledge of the cultural significance to the Sumas First Nation. “We had a solicitor and a real estate agent, and they did their due diligence prior to closing. We weren’t made aware of the heritage conservation issues,” he said. The province keeps a registry of First Nations graves and spiritual sites, but that information isn&apos;t shown on land title documents when someone buys a property, and there&apos;s no system to inform owners whose land is designated. Under B.C.’s Heritage Conservation Act, owners foot the bill for archeological assessments, and risk large fines if heritage sites are destroyed. NDP MLA Maurine Karagianis recently tabled a bill calling for better protection of First Nations sacred sites. Karagianis cited the ongoing dispute at Grace Islet, where First Nations oppose provincial permits issued to build a luxury home on a site containing ancestral cairns. The issue also grabbed headlines in 2012, when a condominium developer and Musqueam First Nation clashed over a lot in Vancouver where ancestral remains were discovered in an ancient midden. But the province&apos;s Minister of Forests Steve Thomson insists the current system works. B.C.’s archeology branch and Sumas First Nation have yet to agree on what land on the site needs protection, but the province issued development permits, after Corpus Management agreed not to break ground without consent from the First Nation. “You want to be respectful of your neighbours, so it becomes a catch-22,” Glazema said. Corpus proceeded to apply for municipal rezoning. But the project went belly up this month, when Abbotsford council rejected the bid, citing the First Nation&apos;s cultural concerns as a key factor in its decision. “There has to be a clear policy put in place. It&apos;s a huge liability for realtors, financial institutions, and property owners,” said Glazema, who is now lobbying the provincial government for compensation. Watch Duncan McCue’s documentary on this story on CBC-TV&apos;s The National tonight at 10 p.m.